Mark Steyn en passant decimates the Lennon mythos regarding the infamous "Imagine" being played after the Paris attacks. 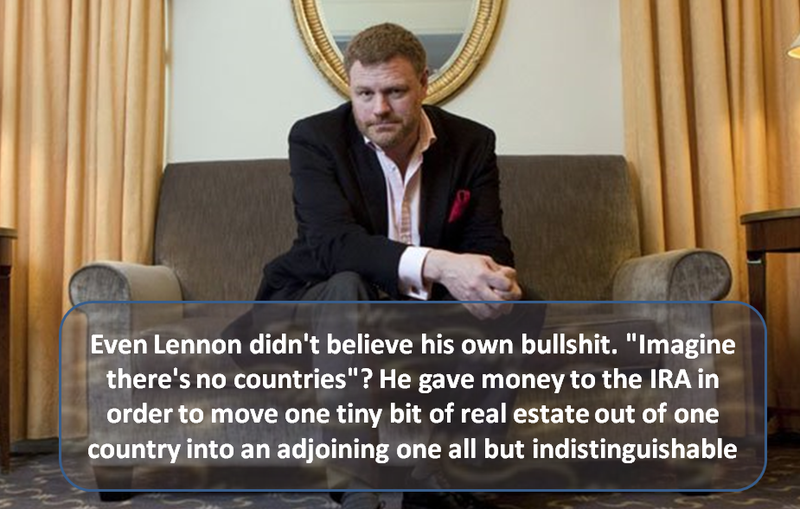 Even Lennon didn't believe his own bullsh*t. "Imagine there's no countries"? He gave money to the IRA in order to move one tiny bit of real estate out of one country into an adjoining one all but indistinguishable - at least when compared to the differences between, say, Sweden and Syria. Imagine there's no John Lennon - because there won't be in Haramistan. Imagine there's no ...nothing. And yes, Steyn meant IRA as in the Irish Republican Army. Not Sinn Fein, the IRA (through proxies). I guess he didn't want to give peace a chance!